Jeffrey Pittman believed The Sikh Temple of Spokane was a mosque connected to terrorism. 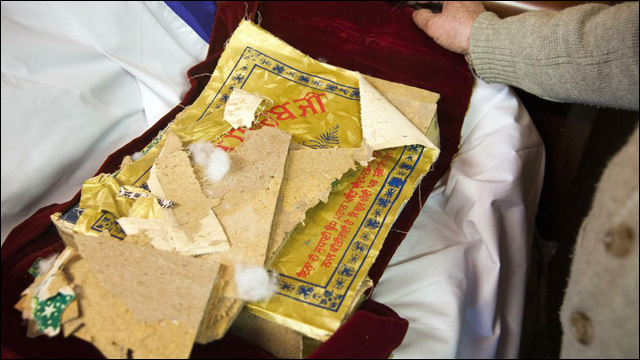 The temple's Sikh holy book was defaced and pages were ripped from it. Yet again, hate and ignorance targets a Sikh community. In Spokane, Washington, a Sikh temple was vandalized by a man who mistakenly thought the temple was a mosque and was somehow affiliated with the Islamic State group terror organization. Yeah, dude. Like terrorists are hanging out in Spokane. On Thursday, 44-year-old Jeffrey C. Pittman was arrested after breaking in and vandalizing the Sikh Temple of Spokane. According to temple leaders, an estimated $30,000 in damage was done to the interior of the temple, including defacement of an altar, the temple's Sikh holy book, and bedding. The vandalism included defacement of the temple's altar, holy book and bedding. Pittman, who apparently broke into the temple because he was cold and hungry, somehow became convinced that the temple was connected to terrorism. Probably because he doesn't know a damn thing about anything, and probably because he's fallen prey to the ignorant, irresponsible Islamophobic rhetoric of the times. Also, he might have been high on meth. Jeffrey C. Pittman, 44, who was arrested early Thursday morning, believed he was in an ISIS-affiliated mosque and told police that thought the building was on fire, according to court documents. He was naked and holding two ceremonial swords when deputies arrived. Pittman told deputies that he removed his clothes and soaked them in water because he believed the building was on fire. He also discharged two fire extinguishers, according to court documents. Pittman said he had flashbacks of being in a fire and believed the building was burning. Pittman said when he entered the temple he "saw all the religious items and started thinking God hated him and had ruined his life." Pittman was arrested and charged with first-degree burglary, second-degree malicious mischief and malicious harassment based on religious discrimination, which is basically Washington's version of a hate crime. His bond was set at $150,000 during a brief court appearance Friday. Meanwhile, the Spokane Interfaith Council is calling on the community for compassion and understanding, and has established a GoFundMe account to help offset the costs of the damage to the temple.